I just finished Allegiant, the third and final sequel in the Divergent series by Veronica Roth. It would be a disservice to give away anything that happens to the major characters, but I have to say that Roth’s writing is as brave and convention-shattering as her main characters. She demonstrates that Young Adult fiction does not have to be safe and comfortable for its audience. Out of the series, I still love Divergent the best because of the newness of the world and the uncertainty and challenge facing the main character Tris as she leaves the self-effacing faction of her childhood for the most wild, dangerous, and even reckless faction for her future. The story follows the conventions of other dystopian series’ like Legend and Hunger Games but stands on its own. The second book in the series, Insurgent, explores the world that was set up to its limits and then breaks it wide open. I didn’t know what to expect from Allegiant. Story-wise, I was lost on some of the details of this second-new world where genetic testing and purity, damage and reconstruction are behind everything I thought to be true. But from a character standpoint, Roth took a leap and pushed her characters beyond anything I’ve read so far. And I realized as I was reading that I didn’t know how she was going to wrap it up. It stopped following convention. And that’s when I became afraid. Like many of these dystopian series, the teenage girl at the center of the story makes decisions with as much logic and analysis as she can muster with a default gut-reaction in her back pocket. The young female protagonists tend to be smarter than average, aware of their own physical limits, and willing to push themselves past all those limitations when necessary. In the real world, the fact that these girls’ decisions end up being the right thing to do would be mostly due to luck, but in these series, these profound consequences are a testament to the girls’ special qualities. The message is clear: Be smart, young ladies. Be brave. Think before you act, don’t let emotions get the best of you. And if you must, take a leap of faith. In the real world, those leaps of faith for a teenager are based on crazy hormonal shifts and raging emotions. While I agree with the sentiment behind these character traits, I don’t know how well they translate. Honestly, it’s confusing being a girl sometimes. I grew up with the whole-hearted belief that I could have a thrilling, passionate, demanding career in a difficult field and still have an incredibly rare marriage and perfect children that I would have time to raise and money to support. I’m not saying this isn’t possible, but as life has surprised me along the way, I have realized that the reality of this belief is not at all like the fantasy in my head. With the pressures women have to be thin, have flawless skin, be perfect and smart and strong and feminine, there is no room for error as these girls navigate into their womanhood. I think of Miley Cyrus, who in all reality is doing exactly what she should be doing as a young, passionate, creative woman. She is being vilified for not being a role model and yet rewarded for her crazy behavior with media attention and money. How will she navigate into adulthood? Obviously celebrities are a special breed, and again the translation to us normal humans is not one-to-one, but still I hope you see my point. The most important aspect of these dystopian young adult series is that these strong female characters face dangers and actually lose something in the process. They face the compromise of life and find a way to keep living. I can’t really recall a story from my formative pre-teen/teen years that offered such a mature outlook on life and the future. The ones that come to mind all offer some kind of replacement solution, usually in the form of a man/relationship. In many ways, it’s heartbreaking to read Allegiant now, as a parent, because I don’t want to think about loss and disappointment for my own children, even though I know it’s inevitable. And worse, I know that loss, disappointment, and failure are all the best teachers to becoming a better person. They can do the opposite as well, but handing someone something on a silver platter doesn’t seem to have done much good for anyone I know. Fighting for what you want, failing and having to figure out which battle to fight, is key to understanding oneself and others. In adult fiction, I keep my guard up as a reader, knowing that all bets are off, but in YA I tend to think there’s a safety in the genre that things will be realistic but not that real. 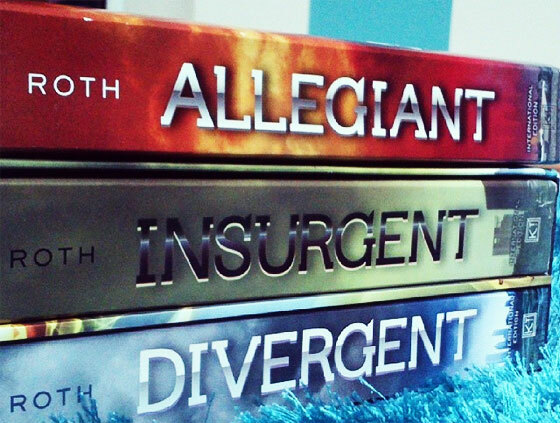 Allegiant blew me away because it shattered all the safe promises the other series keep. What is salvaged from the wreckage of the story is true and beautiful and heartbreaking and the best thing anyone can pass on to the next generation. I literally sobbed at the end. I don’t want to leave these characters. I don’t want to admit that Roth ultimately took my expectations and used them against me, and that I played right into her gifted hands. As a fellow writer, and one who likes to break conventions, I salute you, Veronica Roth. As a reader, you have broken my heart and mended it with the bittersweet truths of your words. Thank you.